Fresh fruit and vegetables are an essential part of our everyday diets, providing vitamins that keep us healthy and strong, and help to ward off illness and disease. Anyone who has eaten a pea straight from the pod, a tomato freshly plucked from the stalk, or a strawberry straight from the plant will tell you that there really is nothing better than home grown. Not only do these fruit and vegetables taste much better, they are also packed with more nutrients, making them better for you and are far less expensive than shop-bought. Anyone can grow their own fruit and vegetables, regardless or space, time or horticultural skill. Read the steps below to find out how to create a basic fruit and vegetable garden that will fit in with your wants and needs. Identify a site for your fruit and vegetable garden. This could be a single border, a few pots on your patio or balcony or a full sized allotment. As long as it’s in a relatively sunny spot, it really doesn’t matter. 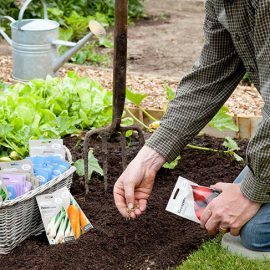 If you’re planting directly into the soil, it’s a good idea to dig the soil over and maybe add some organic material, such as Gro-Sure Farmyard Manure to introduce more nutrients into the soil. If you’re planting into containers, grab a few bags of compost. Find out which one to pick, by reading our How to Choose the Right Compost guide. Choose which fruit and vegetables you want to grow. Unwins Seeds have a great selection, try their Gro-Sure range if you need a helping hand, as these seeds are specially formulated to be easier to grow. At this point it’s a good idea to start with a list of fruit and vegetables that you and your family enjoy eating and feel comfortable cooking! Also good to grow are things that taste much better when home grown, such as peas, tomatoes, potatoes and cucumbers. Use our ‘how to grow guides’ to help you put together a gardening schedule for the season ahead. Don’t worry if you get anything wrong, plants are generally very forgiving and don’t be afraid of asking us questions using our ‘Ask an Expert‘ function, we’re here to help! Also, don’t forget to sign up to our e-newsletter on our homepage to get regular hints and tips throughout the year.